By Elvina Pearce. This is a really lovely collection! We like the sound exploration involved, lots of pedal and changing octaves, using a wider range of the piano than is often used at this grade level. The collection includes duets for elementary (Preliminary) and late elementary (Grade 1) students. Playful solos include Sunrise Waltz,Sand Castle, Sailing, Canoe Ride, Foggy Night and Lighthouse. 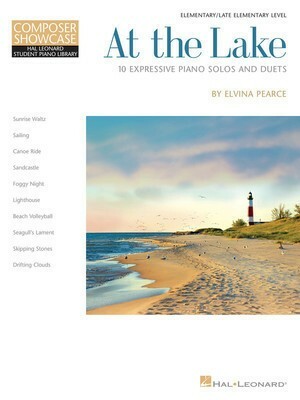 Four delightful duets are included for two students or student/teacher: Skipping Stones, Beach Volleyball, Seagull’s Lament, and Drifting Clouds. This collection invites you to explore the range of the keyboard, dynamic contrast, articulation and other musical expression. Students, parents and teachers will enjoy the practice and performance notes included for each piece. Australian RRP $14.95 Code 131642 available from all these great music stores!